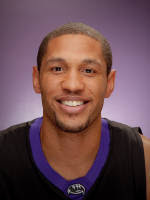 Frank "Mook" Otis limped off the court with loose cartilage in his knee in the first half of the BYU contest, just days after Weber State lost 6-foot-6 senior forward Kyle Bullinger for up to six weeks with a dislocated elbow. Otis, a 6-6 junior forward from Oakland, Calif., is out indefinitely as doctors try to rehab his knee without having to scope it out as they did last spring. There are varying reports on how long Otis will be out... I have heard 2-3 weeks (from someone who talked to Otis), while the coaching staff sounds less certain. It will be a big adjustment to their lineup. When Kyle Bullinger got hurt, they went with a big lineup, and Otis slid from the 4 to the 3. Now, they started G Jordan Richardson at the 2, with Scott Bamforth sliding to the 3. It definitely worked on Saturday, as the Wildcats beat Southern Utah 84-66, taking control of the game and never looking back. It was one of the Wildcats best offensive performances of the year, as they shot 57% from the field. Damian Lillard was the star again, scoring 31 points on 9/15 shooting, and dishing out 9 assists. Kyle Tresnak had 15 points, while Jordan Richardson (10 points) and Byron Fulton (10 points) were also in double figures. Strangely, Scott Bamforth did not attempt a shot, and finished scoreless with 5 rebounds. The Wildcats take on California on Friday in perhaps their last chance to get a real statement, non-conference victory.